Senegalese Meta grew up listening to Gregory Isaacs, Bob Marley, and other reggae greats, and has since embraced hip-hop, rock, and soul. Backed by the Afro-fusion sound of The Cornerstones, and performing in English, French, Wolof, and Fulani, Meta’s powerful voice draws on African roots and reaches global heights. 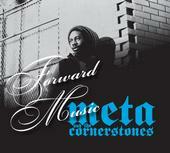 Listen to Meta and the Cornerstones.